Home > Uncategorized	> “Happy Widow’s Day”? This isn’t a post about architecture or Sears Homes or the ghost town of Penniman, Virginia. It’s about surviving to the one-year mark of the worst tragedy I have ever known. Someone told me that yesterday (May 3rd) was “National Widow’s Day.” I don’t know much about that, but I do know that it’s been a little more than a year since my husband killed himself. I understand their position: It’s tough to see someone in pain and it seems that grief - a type of extreme emotional pain - is especially difficult to watch. My husband was seven years my senior and I’d always assumed that I’d outlive him, but not like this and not so soon. I always assumed that I’d be a “good old widow” and cheerfully reminisce and cherish the memories of our long life together. The suicide tainted everything. Every single thing. Obviously, my husband wasn’t happy. Obviously, he didn’t want to grow old with me. Obviously, this wasn’t the love affair I thought it was. Obviously, I was not the wife that he wanted, and obviously, this wasn’t the life that he wanted. But I’ll never know. There were no clues and no hints and not a whiff of an idea of what he was planning. April 18th, 2016, he dropped me off at the Norfolk International Airport so that I could travel to Boston and see my middle daughter. As soon as I landed in Boston (five hours later), I called him and asked him how he was doing. He was starting a big court case on Tuesday morning and I’d been very worried about his health. He answered my questions and then started an argument over the phone. His words were so vitriolic that I was stunned. I asked him why he was doing this. He simply continued with the angry words. Wayne knew, “he who asks the questions controls the conversation.” He was in control of what was going to be our last conversation. I don’t and won’t remember how that conversation ended and/or who hung up first. One year later, it’s a path in my brain that must remain barricaded and closed and permanently sealed, lest I slip into insanity. About 10:00 am, he sent me a text claiming that his next action would be my fault. It was a text that was both puzzling and terrifying. Yet not in my worst nightmare could I have imagined what would come next. As soon as that text had been sent, he turned off his phone and left his office at City Hall. Within 90 minutes, he’d be dead of a self-inflicted gunshot wound. For several weeks, I slept at friends’ homes and lived out of a Harris Teeter shopping bag. I lost more than 30 pounds in two months. Three or four times a week, I returned to my beautiful home in Norfolk long enough to get fresh clothes and then took off again. Sometimes, I traveled to see friends in Illinois. For a couple weeks, I stayed at a religious retreat in northern Virginia. A couple times, I spent the night in the car. So much of that time is lost to memory. I was in deep shock, and didn’t even realize it. Family and friends feared that I was slipping away. There were days that I thought that insanity might provide some relief to the excruciating emotional pain. For the first time in my long life, I understood - with great clarity - why people become homeless and why they become alcoholics and drug addicts. I wanted to slip under the radar of society and take my Harris Teeter bag and disappear into a crowd somewhere and live out the rest of my days, weeks or years with “my people” - the hopeless homeless. Lyrics from my favorite song “Don’t Laugh At Me” (Mark Willis) became crystal clear. Would people say that the day Wayne died was “the day I lost my mind”? People had cracked up under less. Would this be the event that cost me my sanity? For four months, I lived with my friend on a peanut farm. Each evening, when she returned home from work - too tired to take a deep breath - she’d stand at the foot of my bed and talk with me, and pray with me. Every morning, she’d greet me with a smile and pray for me and help me remember that I was loved. There was another friend that I’ll talk more about later. These were two of my angels (and there were so many others), who kept me going when I no longer had the will, the strength, the desire or the vision to face one more day.Without them, I would have been another statistic. Throughout this last year, I have literally craved love. Over on Facebook, at my “Sears Homes” group, I asked the 1,600 members to post a few happy words about how my books had blessed their lives. I read that thread again and again and again. About six months after Wayne’s suicide, I moved into a rental home where I’m living now. I remain hopeful that - in time - I’ll find a home to purchase, and can then unpack my things and restore some order and structure to my life. I know that several readers of this blog are prayer warriors, and believe in the healing power of prayer. If that describes you, I’m so very grateful for your love and your prayers. Please know that at the darkest times of my year, I’ve visualized those many prayers being poured into my soul, and that imagery (and the love behind it) has brought me much comfort. Because of Wayne’s suicide, I’ll never be the same. This has forever changed me. But because of Wayne’s suicide, I’ll always be part of a “club” that understands the full depths of human suffering, as well as the unbelievable amounts of divine love and genuine kindness that can be found in a stranger’s heart. Each day is still a mighty struggle, but each day, I strive to find one thing for which to be sincerely grateful. And many days, I find several things. Perhaps that’s what healing looks like. 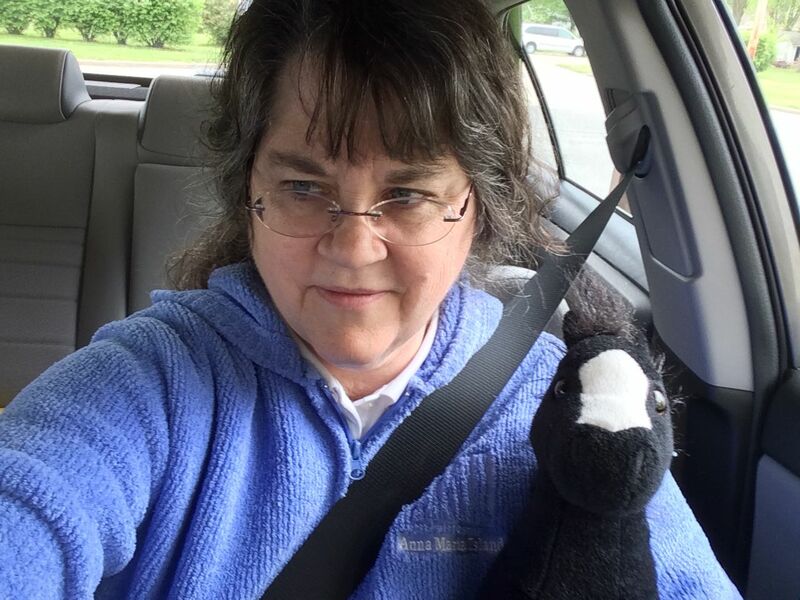 These days, I have a new travel companion: A cute little stuffed horse that's been named "Horsie." Here's Horsie and Rosemary in a selfie, taken in southwestern, Illinois. 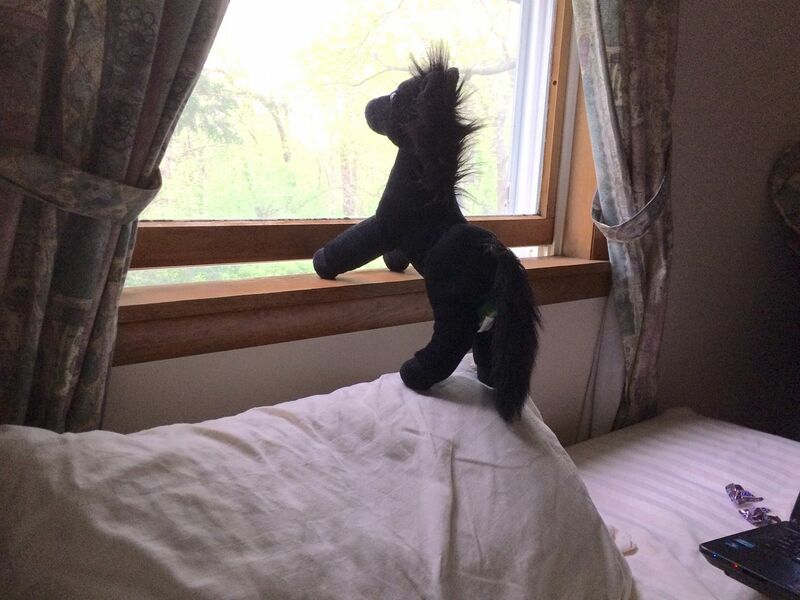 Horsie gazes longingly out the window in Elsah, Illinois. 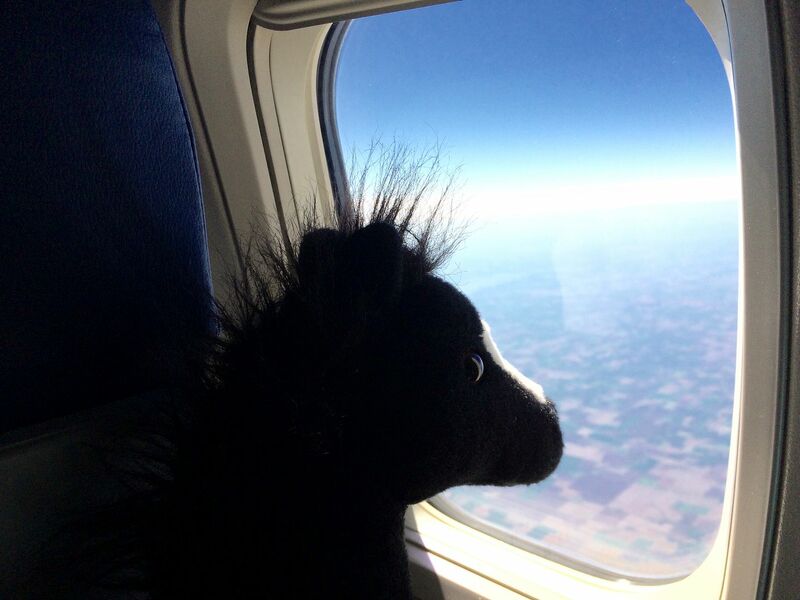 Horsie always enjoys flying in an aeroplane. It's all that darn waiting and security and hassles BEFORE that drive Horsie nuts. On a recent security screening, Horsie endured a very personal examination which left him feeling rather humiliated. 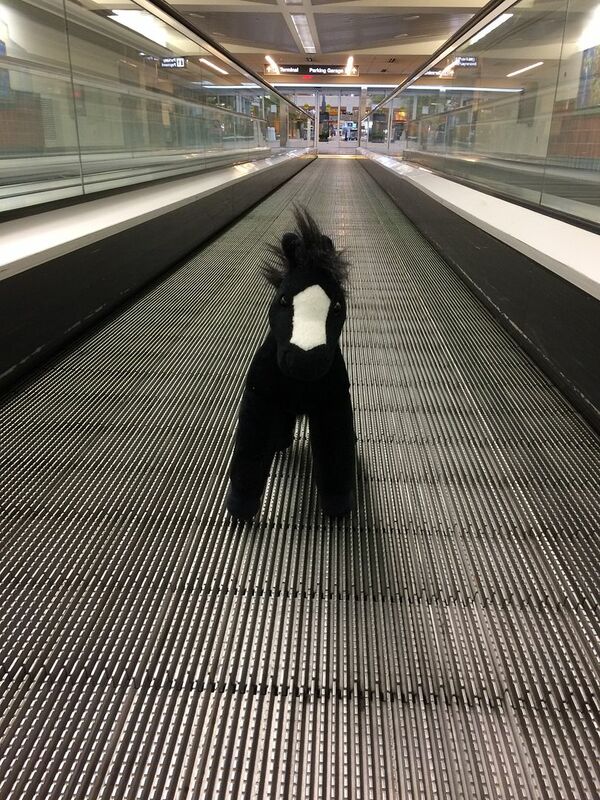 Horsie is glad to be back on solid ground at RDU (Raleigh/Durham airport). Flying is nerve-wracking for so many reasons, and ever more so when you're already stressed from other life events. 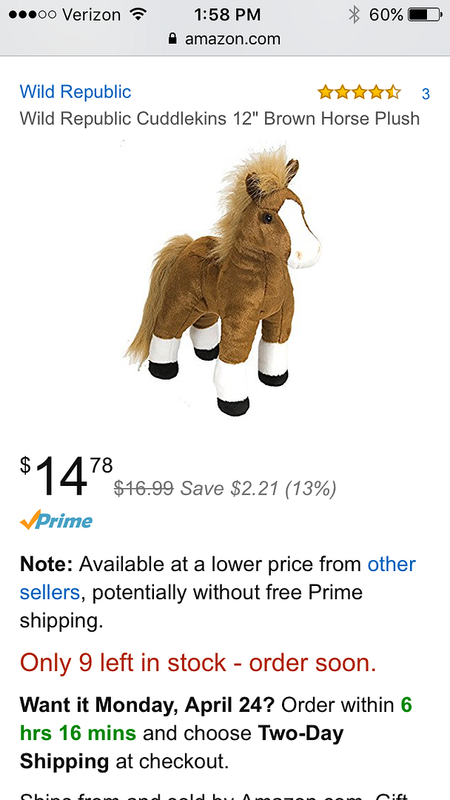 Horsie has brought me so much joy that I decided to add another Horise to the fold. Tentatively named "Horsie II," he's now living with Horsie I in my home in Virginia. 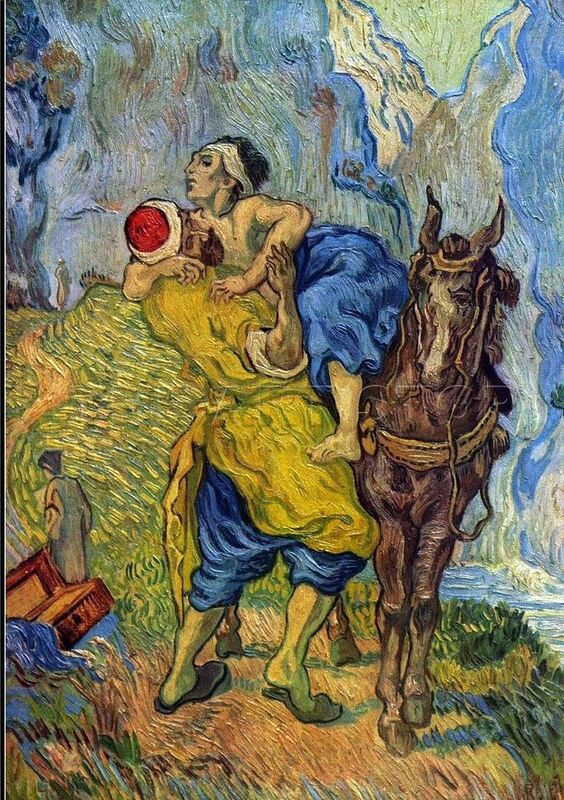 Vincent Van Gogh - The Good Samaritan. Vincent Van Gogh was staying in an institution for the mentally ill (following a psychotic break) when he painted this work, in May 1890. Saving someone who has been given up for dead is incredibly hard work, as this picture so beautifully shows. Dear Rosemary, I am so sorry you are going through this painful experience. I am lost for words . I have had several friends to commit suicide but not a family member. Thank you for sharing your story of Hope for survivors. I remember you from school but we did not know each other very well. Back in those days I had my own issues. I just wanted to extend a hand of hope and love to you. I remember you as a shy brave little girl. And you are still Brave. I would love to read your books. Blessings for comfort and Peace. Rosemary and your two travel companions, I was introduced to you from an older news interview that is archived on YouTube. My daughter recently purchased a Sears Kit home in Morton, IL and I’ve become smitten by them. But, today, I’ve actually met you. Thank you for reaching to the core and sharing your world with us. I believe that the homes you research are a mere example of the kind of person you have lived as. Those homes were built by lives who know the depth of human emotions, yet all the while these people maintained the outer core to stand and eventually continue without them. I pray that even as you feel a deep quaking in your soul you find the strength to stand upright and face another day. Sometimes that’s all we can do. Many happy people surround you and want to share some joy with you. I am so sorry for all that you have endured. It just isn’t fair and no one would be inflicted with the pain you have experienced. You have no idea how many times I have read your blog posts and envied your writing abilities and the experiences you have shared with us while exploring the Sears homes. I particular enjoyed the posts you wrote about researching your father’s history! You really need to turn that story/mystery into a screen play. My heart goes out to you in your grief and loss. Have you ever heard of “Grief Share?” It is offered by many houses of worship. I was deeply hurt to hear of your experience and situation. I pray for you daily and hope you find peace, because you deserve it. There is no specified time to grieve. It takes time to get pass our hurts and issues. Take all the time you feel you need and know that there are people out here who genuinely love you. Please don’t hesitate to let me know if there is anything I can do to help you. I read through your whole blog about a year ago. It was a bright, happy spot in and odd and blah time in my life. After reading your blog I felt, like I knew you, at least a bit, and I was so sad to read Wayne had died. I pray daily that you find comfort, peace, and happiness. As you know, I have followed your struggles with affection and admiration. I will say, I am outright impressed that you are trying so hard to get past the pain by reaching out to others! And since you’re craving love, I will also tell you that I feel honored that from time to time, you’ve chosen to converse privately with me on Facebook. I mean, YOU are the Sears Kit Home Lady! (and I am hopeless at identifying those gorgeous houses, LOL). I continue to cheer you on and send love for as long as you need it, Friend! I am at a loss for words after reading your story. I found myself trying to relate to your pain but after reading your blog all I can say is that I hope you find peace, in your own time and in your own way. No one should experience what you’ve been through. Yes, you are in my thoughts and prayers…. I wish for you to find joy in your life once again. Thank you for sharing something so personal. I don’t think I took a single breath until I’d read it all. No one can understand the depth of your situation but you. That said, don’t ever let anyone take this life from you or drive you to ANYTHING. Keep your personal power, and I’m here to tell you it is awesome ! There isn’t a human being on this earth who is worthy of taking that power. Every time I read something from you, it is plain to see that you are a writer. Expressing ideas in words is easier said than done. Express yourself, get it all out. Then please please please continue to be among us. You are needed. And loved. Play that song again, Fleetwood Mac, Don’t Stop. I now sing it to you every time it comes on my radio. Continued prayers and thoughts are with you Rosemary. We’ve never met in person but you’re close to my heart and I think of you every day. Keep talking, keep sharing, getting the thoughts and emotions out in words will help you continue to heal. You *have* survived the worst of it. You’re​ still taking steps forward even if they are up hill and hard work; you are rising. While I know the life traumas we have both suffered are not the same I do understand how they stay with you forever. That being said eventually you can mentally box them away for most of the time. You also have to shout loud and proud that all this was not your fault and remind yourself daily, we are not personally responsible for the actions of others. Love Horsie but nothing said about Teddy; hope she is doing well. I’ve enjoyed reading your blog now and then and thanks to you and this community find myself wondering if houses I drive by might be catalog homes of some sort. I grew up in one and hope to someday spot another of the same model. It sure does add a smidge of excitement to my drive. I would never wish your experience from the last year+ on anyone. Suicide is such complicated and awful thing for everyone involved. My brother’s best friend committed suicide 18 years ago when he was still in high school. Watching the ripple effect that one event has had on so many lives has made me appreciate how intertwined we all are. One decision by someone in a moment when they felt an emotion I can’t even imagine. Those who survive their decision have to find a way to move on, we can wish that a second, a minute, an hour delay might have made them decide differently. But it is so hard to know what they must have thought that made them believe this was the only decision left for them. Even 18 years later I find myself thinking, “I wonder what Tim is up to?”, and then I remember. I won’t tell you that you’ll ever forget, or move on. But hopefully minute by minute, hour by hour, day by day it will get a little easier, you’ll find something to smile about, find joy in, be inspired by. You inspire so many people and I am so glad to see that you are back at some of the things you used to do! Rosemary, when I was in high school, I was very interested in Sears homes and I ended up writing a term paper on them. The research process led my mother and me to your books and your blogs. My sister and I used the books to build our own Sears homes in the Sims computer games which was great fun. Recently I dug the books back out and wondered how you were doing, so I pulled up your blog. I saw you’ve had some real tragedies and difficulties recently and my heart felt for you. I wanted you to know that your work is inspirational to me and I hope you’re healing these days. Your knowledge and passion makes you a super star, especially since I grew up with the books. I hope soon the tides turn for you so you have more good days than bad. I’ll keep you in my prayers! Hi Rosemary. So wonderful to read my first post of your blog. I look forward to reading more. I read each comment. You have some wonderful followers. Those of us on this journey are the ones that truly understand the grief and the depth of loss, the process and progress. Death by suicide has a large ripple effect. But those at the core of it are hit hardest. Some never recover. I’m glad to hear that you are writing again and gaining some progress and healing. I pray that the Lord bless you and keep you. I pray His countenance be upon you as I believe it already is. You’re an inspiration my friend. I love the pictures and selfies. I’m interested in the religious retreat in northern Virginia. I’d love to get away alone someday. You’re right, Michelle. Those of us “on this journey” are the sad few that can truly understand the unbelievable emotional angst, pain and suffering. And thanks so much for your prayers. Carmen, your comment makes me smile every time I read it (which is often)! These days, I almost seem to have forgotten who I am, and your kind words helped me remember, I was more than just the wife of Wayne Ringer. And now I have to be more than just the widow of a man who committed suicide. Katie, the ripple effect of a suicide is profound. I’ve met many mothers and wives who lost someone to suicide and I always ask them (or their loved ones), how long did it take you to find your way back to life? Beverly, have I told you lately that I love you? I truly do, and I admire you so very much. You’re a remarkable person and you’re also one of the funniest people in my world. When we talk, you always make me laugh out loud. And thanks so much for using a term of endearment. That touched me to my very soul. That brings me much solace. I hope it’s true. Man oh man, do I hope it’s true. I love being sung to, Susan! Thanks so much for the kind words. I’m going to check out the Fleetwood Mac song. It’s been a few years since I really paid attention to that song. Thanks, Nancy. That’s a lovely hope, and maybe - God willing - my joy and peace will return. Rhonda, I’ve thoroughly enjoyed our FB communiques! Thanks (as always) for leaving a lovely comment here. As I mentioned above, I read these comments repeatedly. They always help. Thanks for your prayers, Jenny. I’m sincerely and truly grateful for every prayer offered up in my name. I’ve known since the hellish moment that I received that first phone call (April 18, 2016) that my great need was spiritual healing. And it’s still the true fact. I may take you up on your offer. As I recall, you live in Hampton Roads? Perhaps we could go out and have lunch or dinner at some point. I’ve not heard of “Grief Share.” What is that? Peace is something else that seems to elude me, but something I greatly need. And thanks for the compliment on my writing! I always felt like I was an unexceptional writer who happened upon a few thrilling stories! Now that’s beautiful. Really and truly. Thank you for saying that. Some days, it’s a major accomplishment if I can rise out of the bed, do my hair and brush my teeth. “Facing another day” is sometimes all I can do, and I love how you said this. It helps. Now I’m very curious! How did I know you? Please tell me more! What school did we attend together? Was it John Tyler? That was my favorite school. I learned so much there, and pretty much, everything I know about writing I learned by 6th grade! I am so sorry for the devastating loss of Wayne. Perhaps he wasn’t unhappy in the marriage. Maybe he was having some emotional issue, or mental problem, or financial problem that he had been able to hide up to that point but could no longer deal with, taking it all out on you at the end. I am no psychologist as I’m sure you can tell, but it seems to me if he had been that unhappy in the marriage there would have signs along the way. I choose to believe that he did care for you in his own way. Please don’t blame yourself. I am a believer in prayer so I will add you to my list of people I am praying for. I received in the mail today your book ” Finding the Houses that Sears Built.” Can’t wait to look at it. Carlinville, Illinois Chamber of Commerce has info. about tours of the Sears houses section. I want to go there, but I also want to see the area in Akron, Ohio where Sears houses were built. I called the Chamber of Commerce there because we were recently in Ohio. The lady who answered the phone had no idea where they were and had never even heard of them. Could you give me any info? Thank you so much, and again, I am so very sorry. Suicide is a very selfish act. The survivors are left to comprehend what they should have, could have, or didn’t do, when it was beyond their ability to control the event from the beginning. I’m so sorry for your loss. I am also a widow, and it is a painful journey. I have a private Facebook group for widows. It’s not terribly busy, but it is comforting to have people who share our experience to share with as needed. It’s sort of a PRN kind of group–apply as needed for pain and suffering. There is no words for when something like this happens. This has happened to quite a few of my friends, with their husbands sometimes not a word of discord, eat breakfast leave and are gone forever. Sadly, I know quite a few survivors of suicide and there is never words to comfort, and I doubt there ever will be. I think sometimes the very depth of being is too much for some. I pray that you find comfort and love in each day. You have such a beautiful talent with your writing. Thank you for the gift you have given to your readers.